GRAHAM DAWE can look forward to another trip to Twickenham after guiding Cornwall to the County Championship final. The Duchy produced a storming second half display to overcome Hertfordshire 25-18 in front of a large and passionate crowd Redruth’s Recreation Ground. Cornwall’s hopes of securing a third successive trip to Twickenham did not look great at half-time with them trailing 18-6. The Duchy had been second best for the opening 40 minutes with Hertfordshire, with more than half their starting line-up coming from James Shanahan’s Old Albanian side, scoring two tries and threatening more. 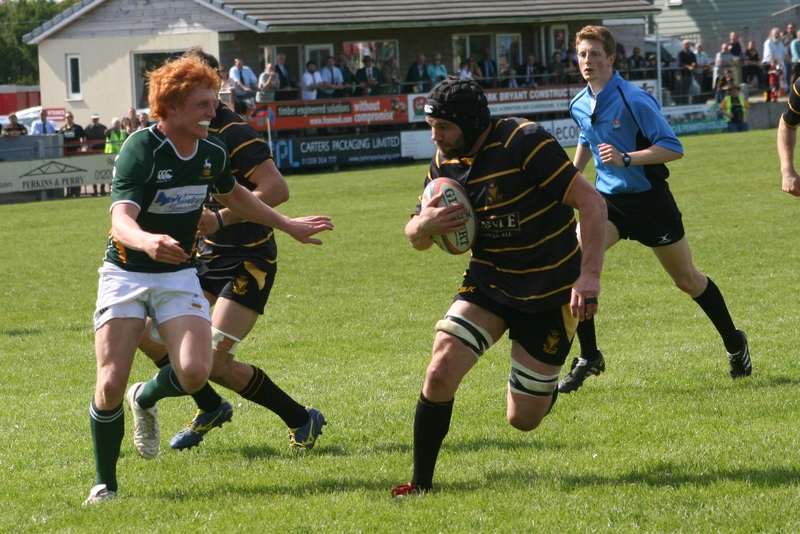 Cornwall struggled to contain the visitors’ centre partnership of Sam Winter and Dan Watt. But whatever was said in the dressing room at the break certainly the trick as the Duchy, led brilliantly by former Albion captain Kyle Marriott, came out a totally different side after the interval and scored 19 unanswered points. Their victory means Plymouth Albion’s director of rugby Dawe, who is Cornwall’s head coach, will be taking part in his 10th County Championship final as either a player or coach. But if Cornwall are going to win their first final in 16 years then they are going to have to beat their victors from the past two seasons, Lancashire. Cornwall will need to play with the tempo they showed in the second half for the whole 80 minutes at Twickenham, if they are to have a chance of ending Lancashire hold on the Bill Beaumont Cup. After defending for the opening few minutes, Cornwall did actually take the lead against Hertfordshire with a Matt Shepherd penalty on seven minutes. But eventually the visitors got the try they were threatening when they charged down a Duchy kick and counterattacked with centre Watt eventually crossing. He also converted to put his side 7-3 up. Shepherd missed one penalty before almost immediately getting another chance, which he did slot over to reduce the gap to one point. But after that Hertfordshire, playing towards Hellfire Corner, built up a 12 point advantage with two Watt penalties and a try from prop Ralph Adam-Hale. The crowd were restless at the interval, but they did not have to wait long for their spirits to lift when Marriott powered his way over on the left on 44 minutes. Shepherd missed the conversion but he kicked a penalty five minutes later after Hertfordshire were penalised for crossing. The Launceston scrum-half, who had scored all Cornwall’s 22 points the week before at Kent, surprisingly missed a penalty on 62 minutes before making amends two minutes later with one in front of the posts after a brilliant Cornwall scrum. Straight from the restart, Hertfordshire had wing Michael Allan sin-binned for a dangerous tackle and Cornwall took advantage with Robin Wedlake going over in the left corner, much to the delight of the crowd. With five minutes of normal time to go, Shepherd kicked a penalty to edge his side seven points ahead, but the Duchy had to see out some nervous moments at the end as Hertfordshire pressed from a five-metre line-out. But Cornwall dug deep in defence to hold on and book their place at rugby HQ. Meanwhile, Devon nearly caused a major upset against Surrey at Okehampton, despite having to play the whole of the second half with 14 men after Ivybridge’s Dom Loomes was sent off for taking a player out in the air from restart. Unbeaten Surrey, who had been 26-9 up at one point, managed to edge out a 33-31 win in a match that not only saw one red card but also five yellows – three for Devon and two for Surrey. Devon did not manage a try in the first half when they had 15 players, trailing 19-9, with Joe Simmonds accounting for all their points. Surrey scored first half tries courtesy of Oliver Turner, Cameron Pimlow and Michael Terelak. The visitors increased their advantage early in the second half with a converted try by James Fa’aatuatu when Devon were down to 13 players after Dean Avery was yellow carded before the break and Loomes sent off immediately after it. Devon, with Ivybridge’s George Wilson starting, got their first try on 47 minutes when Tavistock’s Kieran Murphy crossed, but Surrey went 33-14 up with a try by captain Armand Roux. But that was to be the visitors’ last points as Devon then mounted a comeback. Simmonds got them going with a penalty and then a try and conversion. Devon set up a nervous couple of minutes for Surrey with a converted try by Matt Croscombe, but the visitors held on. Tags: Cornwall, Devon, Graham Dawe, Rugby. Bookmark the permalink.